These mouth watering meatball subs are completely vegan! 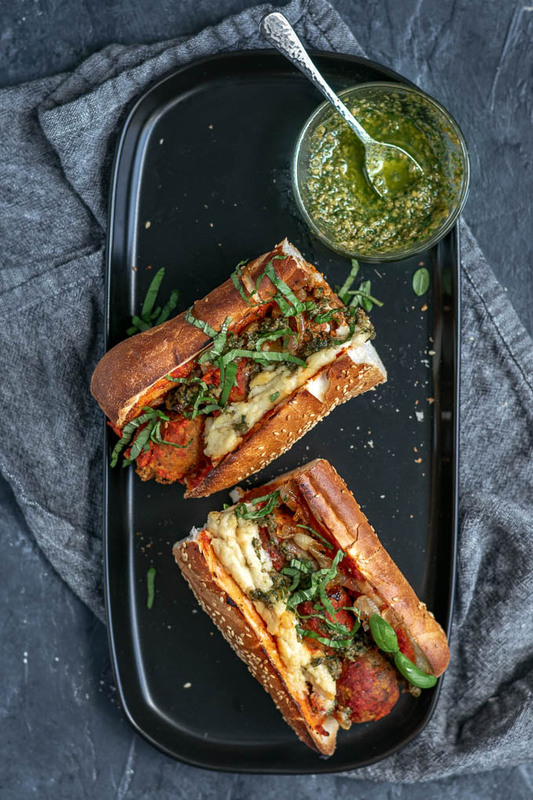 Stuffed with easy chickpea meatballs, marinara, pesto, and homemade vegan mozzarella and baked until hot and toasty. 1. In a food processor add the cooked grain, pecans, and garlic and pulse until finely ground. Add most of the chickpeas (reserve ~1/2 cup), nutritional yeast, sun dried tomatoes, olive oil, oregano, basil, salt, black pepper, and bread crumbs. Process until ground into a thick mixture. Add the rest of the chickpeas and pulse until they are coarsely chopped. 2. Preheat the oven to 375 ºF, and shape the mixture into balls using about 1 1/2-2 tbsp per ball. A cookie scoop makes quick work of this.